Here at Andertons Music Co. we get asked plenty of questions related to gear, and we do our utmost to provide the answers. After all, we know that musicians want to get their hands on the products that can let them sound their best, and one topic that is commonly debated is the importance of a decent guitar lead. In this thorough test, I compare three popular cables from different price brackets and put them head-to-head. The results may surprise you! Ensured that all cables were of the same length, to keep the test fair. Used each cable through a clean and distorted amp (Victory V40 and Blackstar HT100 respectively). Played the same guitar and riffs, to keep the test fair and make the comparisons easier. Picked winners for each test, based on their tonal qualities. An absolute essential, the classic ¼ inch jack-to-jack guitar lead is the key component that connects your guitar to its sound source – an amplifier. But like with most musical equipment, the amount of choice out there when it comes to guitar leads is quite overwhelming. Especially for what is such a simple piece of gear! The number of guitar lead options available is vast, with a raft of companies manufacturing their own. Available in different lengths, the core design elements of guitar leads are more or less the same from brand-to-brand. So why are there still so many different versions out there? Ranging from cheap and cheerful guitar leads under £10 to premium high-end cables exceeding £30, it can be difficult to understand why some cost considerably more than others. So in this next section, we’re going to investigate a few potential reasons. What Does a More Expensive Guitar Lead Offer? The main selling-point that companies convey to market their pricier cables is the superior sound quality that they offer. Stating that they supposedly ‘sound better’ or ‘more transparent’, most will assume that an expensive cable delivers a purer tone. In essence, a good cable won’t colour your sound or neuter any frequencies in your signal. Whilst that may be true, there isn’t really much solid evidence for that. By using more luxury materials and components, such as gold-shielding and thicker insulation, it’s believable that a higher quality cable will provide better longevity. Some will also say that a premium guitar lead will therefore be quieter, whereas a poorly-insulated cheap cables will introduce noise. But ultimately, will these high-end design elements improve your sound all that much? If not, why justify spending so much more money on a ‘better’ cable if the tonal benefits are hardly noticeable? Well, the aim of this article is to find out! In this article, I’m going to compare three cables from different brands that cover contrasting price-points. The aim of this investigation is to find out which cable sounds the best, not to discover which is the most well-made. Of course, I will still detail their specifications, as their build quality could contribute to how they sound. And indeed, this may affect your overall decision-making or final verdict. The cheapest of the three is a simple no-frills Stagg SGC6 6m guitar lead, which you can get for less than £10. With a basic design, this cable is aimed at the player who just wants to plug in and play on a budget. With metal casing on each end, the key soldering points are well-protected to ensure robust operation. The cable itself is quite flimsy however, and feels like it could be easily severed or damaged if trodden on. The second contender, covering the mid-priced bracket, is a Whirlwind Standard Jack-to-Jack 18.5ft guitar lead. Notorious for their robust design, Whirlwind’s Leader series cables feature a patented grip. This essentially absorbs any strain that can typically occur around the connectors, reducing the chance of malfunction. In terms of build quality and longevity, Whirlwind cables are greatly admired, and considered an industry standard amongst their counterparts. Unlike the Stagg SGC6, the Whirlwind cable has a less flimsy feel, giving more reassurance to the user. That’s a bold statement, which meets the criteria of what I believed to be an exemplary cable. We’ll soon find out if that is indeed the case! The Ernie Ball guitar lead’s 99.99% oxygen-free copper connectors are dual-shielded for excellent durability, with the dual conductor design ensuring low noise. Ultimately built to deliver the purest sound without distortion or interference, the shell casing is also more durable than most. This makes it another sturdy and tour-worthy option. How Will These Guitar Leads Be Tested? To make sure that the test between all three guitar leads is fair, I have determined the variables and non-variables. If you’re unaware of what these terms means, the variables are the changeable aspects of the test – the guitar leads. The non-variables are the consistent aspects of the investigation that determine a balanced, level investigation. The most noteworthy consistency between the three leads is their length, all of which are around 20 feet (6 metres) long. This is important, as a longer cable generally takes away top-end presence from your signal, lessening the tonal clarity emitted by your amp. This is why many guitarists use buffer pedals to counteract this issue, lowering the capacitance to retain that precious high-end. So if I used cables with contrasting lengths, the test would therefore be unfair. As by that logic, a shorter cable will give a brighter and superior tone. This investigation will be conducted by playing my Fender Stratocaster guitar into a Victory V40D Duchess for cleans, and a Blackstar HT Stage 100H MKII for distorted tones. No pedals will run between the guitar and the amps, so that the signal between them is uninterrupted for the purest results. This means that their differences will be as discernible as possible, if indeed there are any. My guitar has been freshly restrung with a set of D’Addario NYXL 11-48s, to ensure that the full tonal idiosyncrasies can be heard through the cables. In order to hear and determine the differences between the cables, I will record short excerpts using each one. These clips will be of the same riff in each case, so that they can be compared directly against one another. To capture the audio in these tests, I have mic’d a Victory V212-VC cabinet with a pair of Shure microphones – the classic SM57 and the SM7B. This is being recorded through a Universal Audio Apollo Twin MKII Duo Thunderbolt, a highly-regarded audio interface with studio-quality preamps. Using an iMac that is running Logic Pro X, I will not perform any post-processing to manipulate the recorded audio. This is so that the investigation is kept fair. I’ll identify the best guitar lead of the three as the one that gives the best sound (which is subjective) for that particular tone, and that has audibly produced the widest frequency range. The excerpts with the highest amount of top-end frequencies coming through will also be a key indicator in determining the best. But that’s not all, as the distorted excerpts will also produce some background hiss. Although my Fender Strat is fitted with low-noise Lace Sensor pickups, I will not be using a noise gate pedal to filter out any excess hiss. It’s predictable that all three cables will let some noise through, however the one that produces the least will indicate that it is the best-insulated of the contenders. This test I believe will give the most noticeable indication of the best cable. With a crystal clean sound, there is no break up or overdrive that could potentially negate the sound contrasts between them. You may be thinking: “Why not just plug straight into an audio interface?”. Whilst it was tempting to conduct a DI test, with a preamp introduced, it could potentially exacerbate their sound differences even more. There’s also the fact that most guitar players dislike recording this way, preferring to play through a mic’d amplifier. The Whirlwind cable had arguably the clearest sound of the three, with balanced lows, a strong mid-range and sweet highs, giving plenty of articulation. Whilst the Stagg was very similar tonally, it lacked just a little bit of top-end clarity compared to the mid-priced Whirlwind. The Ernie Ball cable had great top-end sparkle, however it really lacked the warmth and punch of the other two, with noticeably scooped mids. Considering it’s the most expensive cable, its thin sound is fairly disappointing. This test is the one that I’m the most curious about, as with distortion I’d expect it to be harder to tell the differences between the cables. To avoid this, I will therefore play a riff that utilises tight palm-muted single notes, as well as open chords to give the best all-round impression. This was a close call, as the Whirlwind and Ernie Ball cables both sounded very good and quite alike. The Whirlwind guitar lead edged it in my opinion however, as it had a slightly more crisp mid-range. This therefore gave plenty of bite and definition to the riff, lending itself particularly well to this type of tone. The Ernie Ball cable did have marginally more presence, however the low-end had a shelved quality, delivering a thinner and more anaemic sound. Some may consider this more suited to a distorted tone, especially in a recorded mix where removing those frequencies is standard practice. But of course, this is entirely subjective. The punchier mid-range offered by the Whirlwind may be something that other players prefer with a saturated-style distortion. Regarding the Stagg cable, this sounded muddier than its more expensive counterparts, taking it out of contention. Although the aim of this investigation is to distinguish the best-sounding cable, I believe a noise test is worth including. This will ultimately show which cable is insulated and built the most competently, something that I’m sure many people would consider when purchasing a cable. Again, a very hard test to evaluate, but to me it sounded like the Stagg was the quietest. 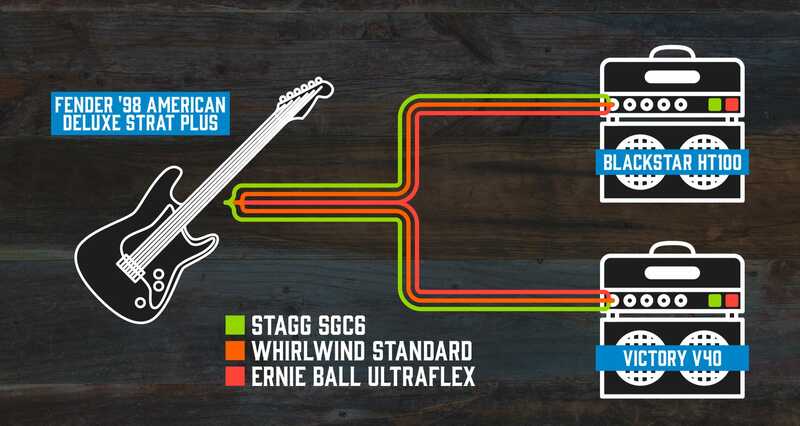 Although its noise level was probably the same as the Ernie Ball cable in terms of volume, the Stagg had slightly less high-end hiss coming through. To the ear, this made it sound marginally quieter. This could partly be attributed to the lack of top-end coming through the Stagg cable in general, something that was noticed and consistent in the playing tests. Despite this, I would still consider the Stagg the winner, which is surprising considering how affordable it is. The Whirlwind was probably the noisiest of the three, but echoing what I said above, that could be because it had the strongest and most full-bodied signal. You could therefore perceive that it is letting more noise through, as across the frequency spectrum it was the most balanced-sounding. Overall, I’ve been surprised by the results of this investigation. As it turned out, the Whirlwind Standard Leader cable, the mid-priced contender, was the best-sounding lead amongst the three. Sounding arguably the best in the clean test, and slightly fuller than the Ernie Ball guitar lead in the distorted test, it is evident that it’s the clear winner. Despite being perhaps the noisiest compared to the Stagg and Ernie Ball leads, the differences were very marginal. It’s not a deal-breaker if you’re interested in buying the Whirlwind, and sound-quality will always come first in my opinion. Regarding the individual tests, contrary to what I believed, the distorted test displayed the most distinguishable differences. Even with lots of gain, the Blackstar didn’t neuter the tonal idiosyncrasies of the cables. Instead, it projected them more! What do you think about the results of this test? Leave a comment and share your thoughts! If you’re interested in finding the answers to some of the most notorious guitar myths around, check out more of our Labs articles by clicking here. Directly into the amp isn’t going to give you much of a comparison test. Put about 6-10 pedals in front of the amp, and then try cheap plastic Hosa patch cables vs actual patch cables. Throw the pedal board in your car and off to a gig a dozen times and see how well the cheap cables hold up. This test kind of missed the mark. Hi there, very interested to look at your work on guitar leads. Have carried out much work myself and found that in the early 90’s Fender leads, manufactured by Whirlpool, got really good with a wide frequency response and low noise, similar to using an average Audio lead for guitar cable. Using better than average Audio lead instead of guitar cable increases tonal colour depth volume and frequency even more. Playing POP on stage with this arrangement in a Covers Band in the 70’s – the sound boost is very akin to wiring in the pickups direct without the volume and tone controls in the way. Never used anything else until the Fender leads came along in the 90’s which were almost as good as the Audio leads. Someone at Whirlpool had done their homework at last but alas they were changed again later on. I’ll leave you to go through whatever happened to the Acusonic+1 H1-z Capacitance Corrected cable residing in the “where is it now file”. Rang them up in the States spoke to a several senior Geeks until I found one that remembered what they had done. He said they had changed the spec but they didn’t think it would make much difference. They had reduced the available frequencies through the changes but they didn’t think it mattered. A super, well considered, caring, research result. Sweep the market with that downgrade wouldn’t you know? Hosa patch cable is rubbish but Hosa mid range audio cable cut up and made into patch cables and guitar leads, is well worth doing and it doesn’t cost much. All the frequencies to come through in bucket loads and tonal headroom is everywhere, guitar response multiplied little or no increase in cable noise compared with almost any guitar lead. The high gain cables made for metal can be exceptionally quiet and are a completely different consideration. Thanks for your comment, that’s very interesting indeed! It gives us food for thought for another article, where we could dig deeper into cable construction and materials used, etc. Many people would argue that £20-30 is all the same price range given that you can easily spend £200+ on a cable. Whirlwind Leaders have always been a solid choice and for all we know might cost more to make than the Ernie Ball. You have at least proved what some of us knew all along – there are good and not so good cables. Now let’s hear about some of those really expensive ones to see if they are at all justified. That’s an interesting argument, and it was something that I had considered when planning this piece. However, not many people purchase cables above £30, so I thought it would be more beneficial to most players if I compared cables that were only £10-£15 apart, to discern if that little extra would produce better results. However, a Part II to this might be interesting, where we compare cables of vastly different price-points. We’ll see!